The Lancaster (PA474), Spitfire Mk IIa (P7350) and Hurricane Mk IIc (LF363) of the Battle of Britain Memorial Flight. The markings on the Lancaster represent the famous ‘Phantom of the Ruhr’ aircraft from 100 Squadron. 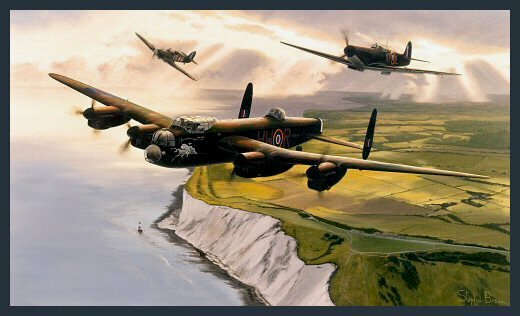 They are depicted over the cliffs of Beachy Head, the scene of ferocious aerial combat during the Battle of Britain. Formed in 1957 The Battle of Britain Memorial Flight is a living tribute to the bravery of RAF pilots and aircrew during World War Two. Over 50 years on it continues to thrill and delight many thousands of spectators at airshows all over the UK. Please note: a small canvas edition is planned for a later date.